Janine Wedel speaks in a variety of milieus, from academic and think tank to media, business, and civic organizations. She has been invited to address interdisciplinary audiences at Harvard, Yale, Columbia, MIT, Chicago, Berkeley, and Oxford and at National Research Council/National Academy of Sciences workshops. She was recognized as one of a handful of "Distinguished Alumni" Ph.D.s chosen to speak at the Berkeley anthropology department’s Centennial celebration. Decades of Excellence, Spring Centennial Conference, Berkeley,April 13, 2002. 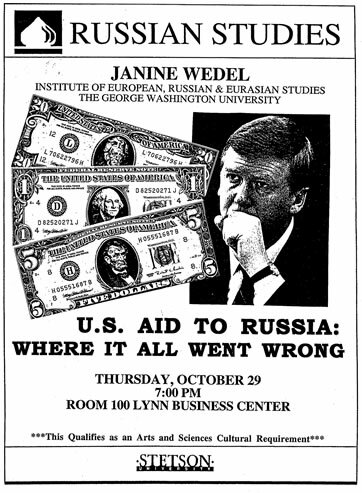 Bryon Sabol, "Wedel speaks out about Western Aid to Eastern Europe," The Daily Athenaeum, West Virginia University.